Dave Grohl’s Sound City Players performed at New York’s Hammerstein Ballroom last night. However, prior to the near-four hour performance, the drummer turned frontman turned documentarian visited The Colbert Report to chat about his Sound City documentary. Surprisingly, Colbert kept things tame and straightforward by his standards. Yet the two shared quite the rapport as they reminisced about their time in The White House together. From there, the discussion shifted to the film, Nirvana, and the studio’s legendary Neve 8028 analog mixing console. While looking at a superimposed photo of the console, Colbert joked: “Did Evil Knievel jump this board over Charles Manson? That I would pay to see.” That’s just one of man kickers. Replay below. 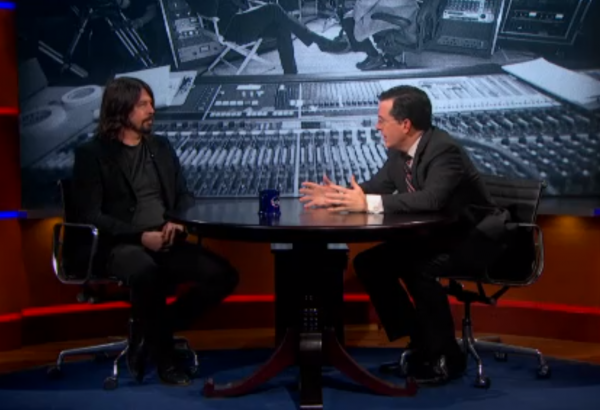 Grohl will be back on television tonight when he, Stevie Nicks, and the rest of the Sound City Players perform on Late Show with David Letterman. In the meantime, check out our review and photos of the band’s recent show in Hollywood, CA.